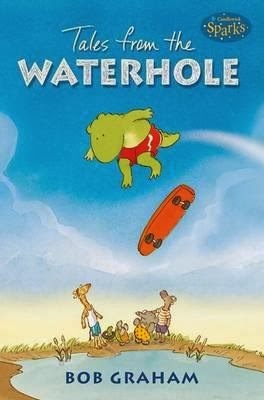 Tales from the Waterhole comes from fantastic Candlewick Sparks series for those just beginning to read. There are 27 books in the series written and illustrated by popular authors, using loved and known characters. This four chapter book offers short stories with Morris and his animal friends that live around the waterhole of the African savannah. Bob Graham’s easily identifiable watercolours bring to life the animals’ antics, their fun-loving characters, and the theme of friendship within a perfect blend of illustration and simple prose. This series is produced in a new edition which is smaller than the normal sized picture book, and will fit neatly on any child’s book case.